Ricardo Pilguj, currently working at Lurssen, has presented his latest concept, project RP80, which will be his entry for the 2017 Young Designer of the Year Award. 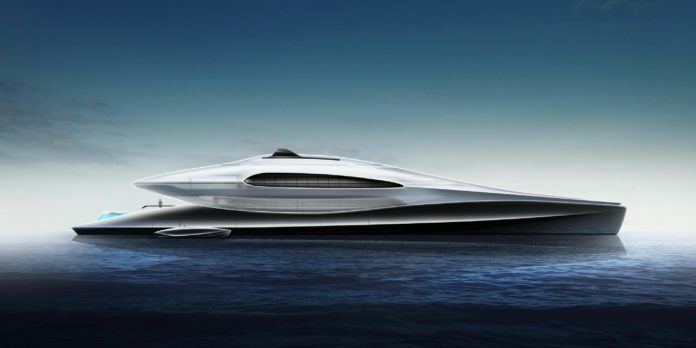 The main task of the famous competition was to design a “a modern and supremely elegant 80-metre yacht and two suitable tenders, which would match the exterior style of the mothership”. Project RP80 houses two 10-metre tenders. The open and limousine tender are stored on each sides of the garage. Both tenders are powered by a pair Volvo Duoprop D6-6400/DP Sterndrive. Two further dinghies are stacked and the three jet skies are located in the centre of the garage. The first one is a 13.2-metre limousine tender which flies over the water thanks to retractable foils. When the foils are moved in the tender measures 10 metres. To increase the visual effect of flying over the water the centre bottom of the interior lounge is designed to be transparent. A holographic sea map is projected at the centre of the interior to see the next destination. The second tender is an 10.8-metre open tender for exploration. When anchored the side-bulwarks can be folded down to increase usable deck space for sunbathing. All three boats follow the same design language that make them truly recognizable of the same kind.